This post contains affiliate links. Read my disclosure policy here. The Ultimate Vegan Mac n Cheese ~ super creamy, rich & oh-so dreamy! It takes less than 30 minutes to make & it’s gluten-free. I’ve been on a little comfort food kick lately, and I’m taking it all in before the warmer weather hits. I live in the desert, but it gets a little chilly during the winter. 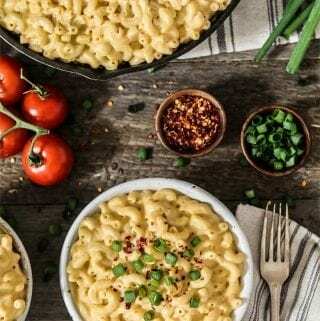 I love having comforting foods to keep me warm & cozy, and this Ultimate Vegan Mac n Cheese is the perfect way to do it. What makes it THE ultimate? Well, it’s super creamy, velvety-smooth, rich, mouth-watering, and the cheesiest mac in town! This is a family favorite and we enjoy it at least once a week, along with Finger Lickin’ Good BBQ Cauliflower Wings. It’s the perfect combination and total comfort on a plate! Some people out there (a.k.a the meat & dairy industry) don’t like when vegans use words like meat, milk or cheese to describe our food because apparently, it confuses consumers into thinking they’re buying “real” animal-based products. Ya know, like that “real” neon-orange block of cheese that doesn’t need to be refrigerated? That was more like a science project gone wrong. Well, the utter truth is that consumers are waking up to the suffering and damage that animal-based foods are causing, and they’re choosing to buy the latter. 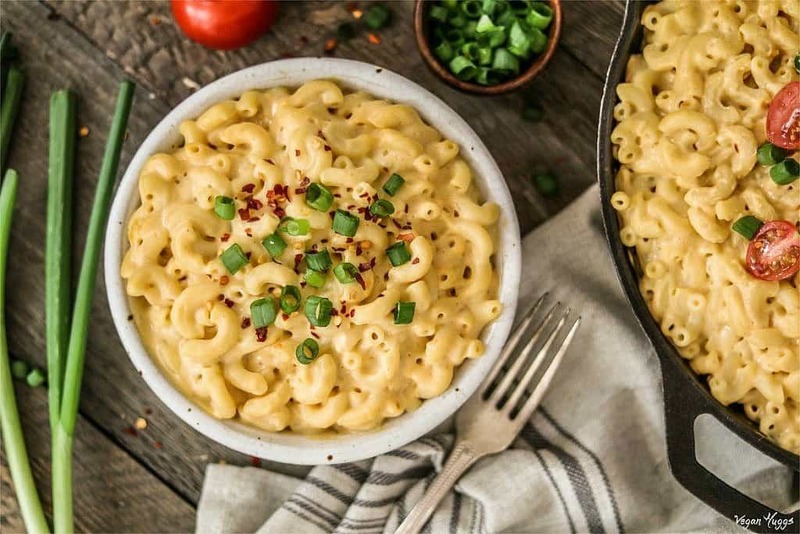 This Vegan Mac n Cheese is twice as delicious, 100% healthier, and 100% kinder than its animal-based counterpart. Maybe it’s not made with “real” cheese, but it sure tastes like it is, so why would I change the name to something else? It’s not confusing… it’s damn delicious! What’s in this Vegan Mac n Cheese? There are lots of ways to make a vegan cheese sauce. I love using cauliflower, cannellini beans, and I especially love using butternut squash, like I did for my Spicy Nacho Cheese. It creates a creamy, buttery texture, and a gorgeous color too. I have a Baked Butternut Mac recipe I’ll be sharing soon, so stay tuned. Normally, I’ll just use a blend of turmeric, paprika, nutritional yeast, and chili powder to get that cheesy color. I didn’t think of this genius idea up on my own, I saw it on Veg News Magazine a while back, and I’ve meant to give it a try. The carrots worked out perfectly in this dish, and I’ve added another recipe to my arsenal now! To make the sauce extra creamy, I used unsweetened soy milk and raw cashews into the mix. When processed together with the potatoes & carrots, it makes an ultra-rich sauce base to drown your macaroni in. The cheesy flavor is created with nutritional yeast (a.k.a nooch) and fresh lemon juice. For that cheesy stretch we all love, I added tapioca starch. Nooch is a magical ingredient that turns your delicious cheese sauce into a melty, stretchy, vegan miracle! I sautéed fresh garlic in vegan butter before adding the cheese sauce to the pan. It makes everything more savory and gives a buttery-garlicky kick. Now that’s what I’m talking about! If you aren’t into butter or fresh garlic flavor, you can definitely omit the step entirely. I would add at least 1/2-1 teaspoon of garlic powder to the sauce though, and stir it often, so it doesn’t burn. Now, Grab a fork and enjoy! 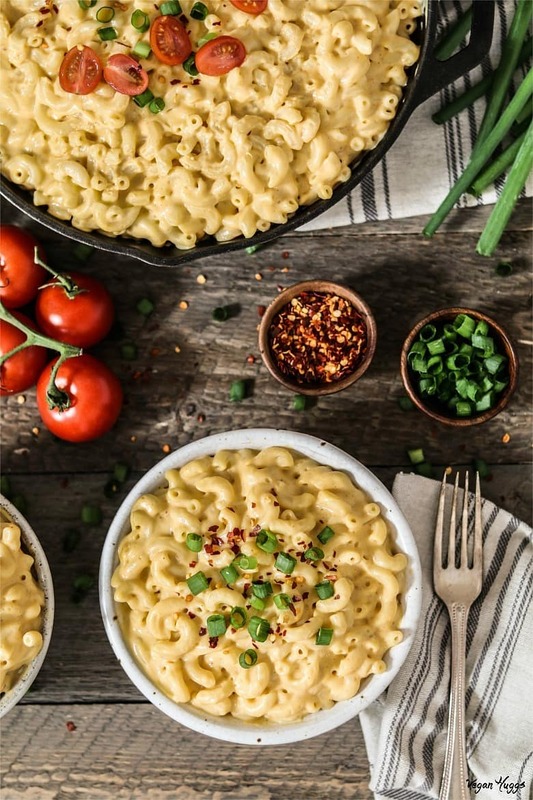 If you make this Vegan Mac n Cheese, I’d love to get your feedback. You can leave a comment below and let me know what you think. It would really make my day. You can also follow me on Instagram and share your creation with me. Just tag me @veganhuggs and hashtag #veganhuggs so I don’t miss it. 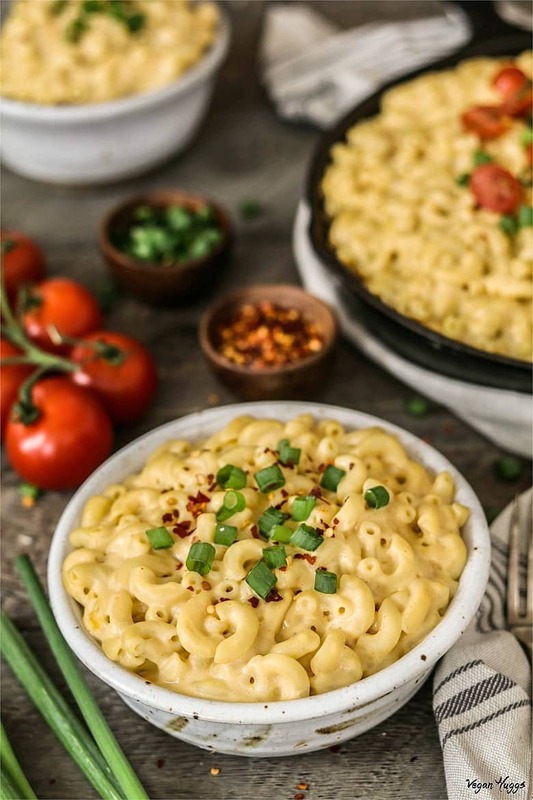 The Ultimate Vegan Mac n Cheese ~ super creamy, rich & oh-so dreamy! It takes less than 30 minutes to make & it's gluten-free. Steam or boil the potatoes & carrots until tender (about 8-10 minutes). Drain and set aside. Place macaroni in a large pot of salted boiling water. Cook until al dente & according to package directions (about 9-10 minutes). Drain and set aside. Drain & rinse cashews and discard water. Now place all ingredients in a high-powered blender (except garlic & butter). Blend until potatoes, carrots & cashews have completely broken down & sauce is smooth, about 1-2 minutes. Set aside. Heat up butter in large pan over medium heat. When melted, add garlic & sauté for 1-2 minutes, until lightly brown (be careful not to burn). Pour in cheese sauce and cook for 4-5 minutes, until sauce thickens up and becomes slightly stretchy. Stir often to prevent burning. If it's too thick, add a small amount of broth & stir. Taste for seasoning, and add more if needed. Now add pasta and gently toss to coat. Serve immediately. Enjoy! To make things easier, you can prep ahead, and pre-soften your cashews by placing them in cool water for 4 hours or overnight in the fridge. Then they'll be ready to pop in the blender right away. I usually start blending the sauce 5 minutes before the pasta will be done. This way the pasta isn't sitting too long, and it will be hot & fresh when it goes into the sauce. I boil the vegetables and pasta at the same time (not same pot) to make it faster. They take about the same time to cook, so it works out perfectly. You could also cook the potatoes and carrots the night before and pop them in the fridge. This will make things even faster and easier at mealtime. If you'd like a thinner cheese sauce, use only 2 tablespoons of tapioca starch, or omit it altogether. The sauce will still be rich and creamy. Tapioca starch provides extra thickness and a slight "cheesy" stretch. The cheese has a very smooth and creamy texture. So, if it comes out a bit grainy, you may need to blend longer. If it's still grainy, your blender may not be strong enough to pulverize the cashews completely smooth. If you think your blender might not work properly, just soak the cashews for 8-10 hours or overnight in the fridge. This will make them soft enough for most blenders. If you'd like to add another layer of flavor to the sauce, you can try 1/2-1 teaspoon of miso paste or dijon mustard. Blend it up with the cheese sauce. Tried this recipe?Follow me @veganhuggs and mention #veganhuggs! Receive the tastiest vegan recipes straight to your inbox! Join now and get my Fan Favorites ebook FREE! I’m so excited to make this! I’m making this for thanksgiving. What is the best way to prepare, if I’m cooking ahead of time(I have several dishes to make)? Would you recommend cooking, and then warming up before serving? Thank you! Very easy to prepare and so yummy! Added miso paste + Dijon. My non-vegan 7 year old ate her whole bowl! Hi Brittanie, thank you so much! I’m so happy you guys liked it! I love that you added miso paste and dijon. Must’ve been fantastic! Thank you for sharing that. Have a lovely week! Melissa, I made this tonight and it was great however there is sooo much sauce left over. Can I freeze the sauce in bags to pull out at a later time? If not, how long does it last in the fridge? Oh My! This sauce is amazing and SO easy since everything goes into the blender. I am a newbie so this is my first try at vegan mac and cheese. I am making pasta for my son who is inspiring me to go vegan, and I’m eating the sauce on cauliflower. Can’t wait! I think I could eat the sauce all on its own with a BIG SPOON! LOL. Thank you! Hi! I’m so excited to try this recipe! What kind of potatoe did you use? Just finished a heaping bowl of your vegan Mac n Cheese. The flavor and texture were perfect. It was quick and simple to make. Thanks for sharing!! 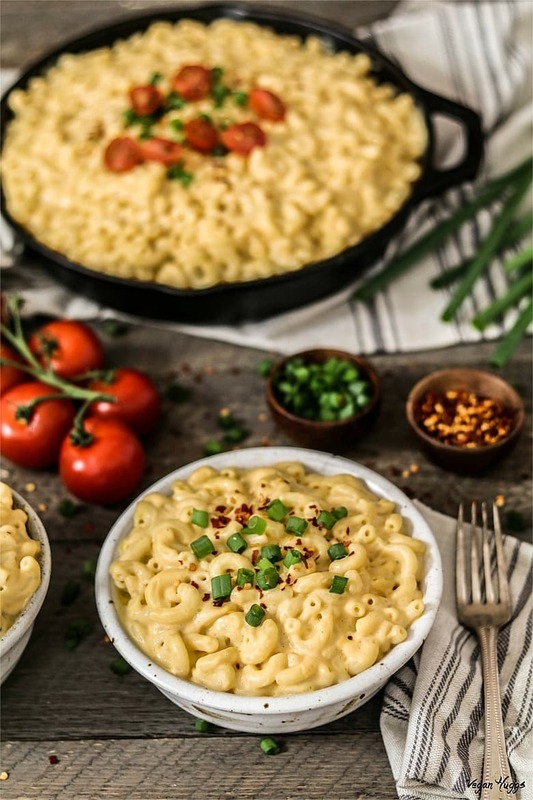 I have tried several different vegan Mac n cheese recipes and shuns the other ones were alright, this one is by far the best. 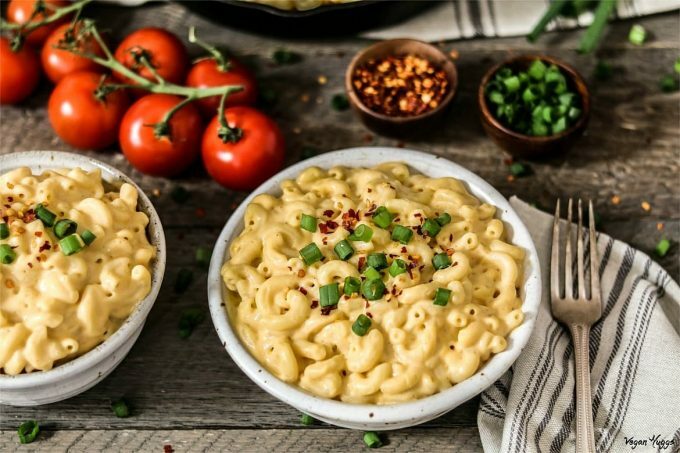 Mac n cheese had always been my go to comfort food and now that I found the perfect vegan version I won’t feel like I am missing my favorite comfort food anymore. Have you frozen the sauce before? Hi Vanessa, thank you so much! I’m so happy you liked it! Mac n Cheese is my favorite comfort food too. 🙂 I haven’t frozen the sauce yet, but I will the next time I make a batch. I’m curious now. This was a huge succes. Everyone in My family loved it. Thanks from Denmark. This recipe is great! I made it for dinner last night and my husband and I loved every bite. Thank you for sharing it! I’m a long time vegetarian, but new vegan (~1 month in). I really miss cheese. But this is my new fav vegan mac and cheese recipe! My hubby is not vegan, but willing to eat anything that tastes good. He loves spicy food, so I added some chili powder and canned green chiles. It was so delicious and really creamy! Thank you! I might try a chipotle version. If I do, I’ll let you know how it goes. Hi Teresa! Congratulations on your new vegan journey! Cheese was the hardest for me too. I really missed it for a while, but the cravings faded away eventually. Especially, with all the tasty alternatives available today (homemade and store-bought). No joke- I have tried dozens of vegan mac n cheese recipes, some wildly successful, some not so much. This one tops the list. It combines every feature of delicious recipes and is just so damn tasty. I sauté a bag to a bag and a half of Beyond Meat Chikn Strips with Earth Balance, garlic powder, and cayenne to add to it. I’m actually about to make it now for three non-vegans (my non-vegan bf says it’s the best he’s ever had). So thank you! Hi Alyssa! This is so wonderful to hear! Thank you so much! I seriously have to try it with the Chikn’ strips. That sounds insanely good! Thanks for the idea! Have a wonderful holiday! I’m so excited to try this recipe as a side for Christmas dinner. would it hold up in the oven after mixing sauce into pasta, topped with an olive oil bread crumb topping? This was very good, thank you! I added Dijon mustard and hot sauce to the sauce (the mustard especially gives it extra depth of flavor) and it was so easy to make! Thank you! This Mac and cheese is awesome. Followed the recipe as written, and I wouldn’t change a thing. This is the first vegan Mac and cheese recipe I have ever tried, if I hadn’t made it myself, I never would believe that it doesn’t contain cheese. Thanks for a great recipe! Thanks for your amazing Mac and Cheese recipe. I’ve tried a few others and wasn’t thrilled. This one has great cheese consistency. Thank you! I followed this almost to a T and it came out amazing! My non-vegan family members loved it. I’d recommend adding more nutritional yeast and using regular noodles if possible. I’ve also experimented using sweet potato in place of regular potato and loved the result! Everyone should try this at least once. Hi Christina, Oh no… Do you mean the pasta was gritty? Was it gluten-free? I’m so glad the school is introducing a vegan menu. I think it’s going to be fantastic with your touch. 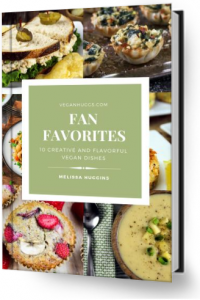 Join today and get my Fan Favorites ebook FREE and be the first to get notified on new recipes and updates.